Thanks to your feedback, Swimia has become in just several months one one of the most significant sites of swimming pools. 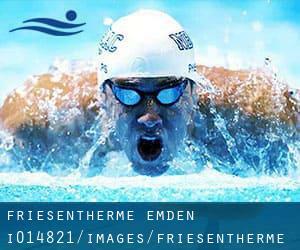 Here you may have all the info we know about Friesentherme Emden, in Emden. Don't forget you can also promote this pool so Friesentherme Emden will appear the first of Emden, or perhaps the very first of one's country, contact us to know more. Swimmers like you reported 25 meters x 12.5 meters, 5 lanes, Indoors. Unfortunately we do not have the email address of this Pool, but we can give you the phone number. Updated on 2019 Jahnallee 1 , Westerstede , GERMANY (Postal Code: 26655). Swimmers like you reported 25 meters, 4 lanes, Indoors. Phone number and e-mail address are number for this Pool. Updated on 2019 Panther Business Center , Mittelweg 7-8 , Braunschweig , GERMANY (Postal Code: 38106). Swimmers like you reported 20 meters, Indoors. Phone number and email address are number for this Pool. Updated on 2019 Bienroder Weg 70 , Braunschweig , GERMANY (Postal Code: 38106). This sports center offers 25 meters, Indoors. Contact data for this Pool such as phone number and email address are number. Updated on 2019 Goethestrasse 27 , Borkum , GERMANY (Postal Code: 26757). Among all the activities offered by the center, should you be keen on swimming you will enjoy 25 meters x 10 meters, Indoors. If you need to get in touch with this Pool, email address and phone number are both number. Updated on 2019 Unterwallweg 5a , Bueckeburg , GERMANY (Postal Code: 31675). This sports center gives 25 meters, 5 lanes, Indoors. Contact knowledge for this Swimming Pool such as phone number and email address are number. Updated on 2019 Zum Salzgittersee 25 - 27 , Salzgitter , GERMANY (Postal Code: 38229). This sports center provides 25 meters, 6 lanes, 2 meters - 3.8 meters depth, 2 meters - 3.8 meters depth, Indoors. Contact data for this Pool similar to phone number and email address are number. Updated on 2019 Thouarsstr. 1 , Diepholz , GERMANY (Postal Code: 49356). Swimmers like you reported 25 meters, Indoors. Unfortunately we do not have the email address of this Swimming Pool, but we can give you the phone number. Updated on 2019 Goethestr. 3 , Zeven , GERMANY (Postal Code: 27404). This sports center provides 25 meters, 5 lanes, Indoors. Contact information and facts for this Pool such as phone number and e-mail address are number. Updated on 2019 Im Wegrott 37 , Osnabrueck , GERMANY (Postal Code: 49084). This sports center offers 25 meters, Indoors. For this Swimming Pool, only phone number is number here. Updated on 2019 Breitinger Kirchweg 7 , Rotenburg , GERMANY (Postal Code: 27356). Among all of the activities offered by the center, for anyone who is interested in swimming you may delight in 25 meters, 6 lanes, Indoors. Just in case you wish to contact this Swimming Pool before dropping by, we only know the phone number. Updated on 2019 Ludwigstraße 3 , Berenbostel , Garbsen , GERMANY (Postal Code: 30827). This sports center delivers 25 meters x 12.5 meters, Indoors. Contact data for this Swimming Pool for instance phone number and e-mail address are number. Updated on 2019 Lange Feldstraße 15 , Gehrden , GERMANY (Postal Code: 30989). Among all the activities offered by the center, if you are interested in swimming you will get pleasure from 25 meters x 10 meters, Indoors. If you will need to contact this Swimming Pool, email address and phone number are both number. Updated on 2019 Klosterstraße 19 , Rinteln , GERMANY (Postal Code: 31737). This sports center offers 25 meters, Indoors. Contact information for this Swimming Pool similar to phone number and email address are number. Updated on 2019 Engelader Strasse 3 , Seesen , GERMANY. Swimmers like you reported 25 meters, Indoors. Unfortunately we do not have the e-mail address of this Swimming Pool, but we can provide you with the phone number.